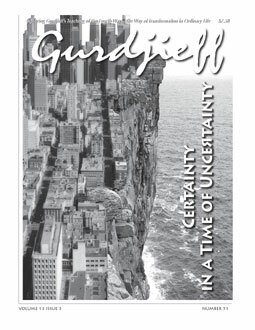 The financial meltdown, doomsday scenarios, the Mayan Calendar's 2012how to come to certainty with so much uncertainty? The prolongation of human life is key in developing higher levels of being and bodies. What part does physical food play? What did Gurdjieff serve at his table? The continuing exploration of how different religions and paths view the soul. Carl Zigrosser, an early American student, reports on his visit and makes some unusual discoveries. Gurdjieff always said he took the bad end of the stick so we could have the good end. But what does that mean? In what way do we take the good end? There is a wiseacre idea floating about that Frank Pinder was a "Patriarch" of the Work. When Was Gurdjieff Born1866, 1872, 1877? Gurdjieff's passport says 1877, Olga de Hartmann, Louise March, John Bennett, and William Patrick Patterson say 1872, but James Moore says 1866.